For a combustion process that takes place adiabatically with no shaft work, the temperature of the products is referred to as the adiabatic flame temperature. This is the maximum temperature that can be achieved for given reactants. Heat transfer, incomplete combustion, and dissociation all result in lower temperature. The maximum adiabatic flame temperature for a given fuel and oxidizer combination occurs with a stoichiometric mixture (correct proportions such that all fuel and all oxidizer are consumed). The amount of excess air can be tailored as part of the design to control the adiabatic flame temperature. The considerable distance between present temperatures in a gas turbine engine and the maximum adiabatic flame temperature at stoichiometric conditions is shown in Figure 3.24(b), based on a compressor exit temperature of (922 K). An initial view of the concept of adiabatic flame temperature is provided by examining two reacting gases, at a given pressure, and asking what the end temperature is. 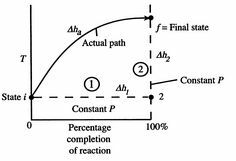 The process is shown schematically in Figure 15.3, where temperature is plotted versus the percentage completion of the reaction. The initial state is and the final state is , with the final state at a higher temperature than the initial state. The solid line in the figure shows a representation of the ``actual'' process. The value of the adiabatic flame temperature given in Equation (15.5) is for 100% completion of the reaction. In reality, as the temperature increases, the tendency is for the degree of reaction to be less than 100%. For example, for the combustion of hydrogen and oxygen, at high temperatures the combustion product (water) dissociates back into the simpler elemental reactants. The degree of reaction is thus itself a function of temperature that needs to be computed. We used this idea in discussing the stoichiometric ramjet, when we said that the maximum temperature was independent of flight Mach number and hence of inlet stagnation temperature. It is also to be emphasized that the idea of a constant (average) specific heat, , is for illustration and not inherently part of the definition of adiabatic flame temperature. Bring reactants to [the term ] from the initial temperature, using whatever heat transfer, , is needed. In this example we do not need step (i) because we are already at the reference temperature. Reaction at [the term ]. There will be some heat transfer in this step, , out of the combustor. Put back heat into the products of combustion. The resulting temperature is the adiabatic flame temperature. or a more accurate solution using the tabulated values for gas enthalpy in Table A.8 of SB&VW.